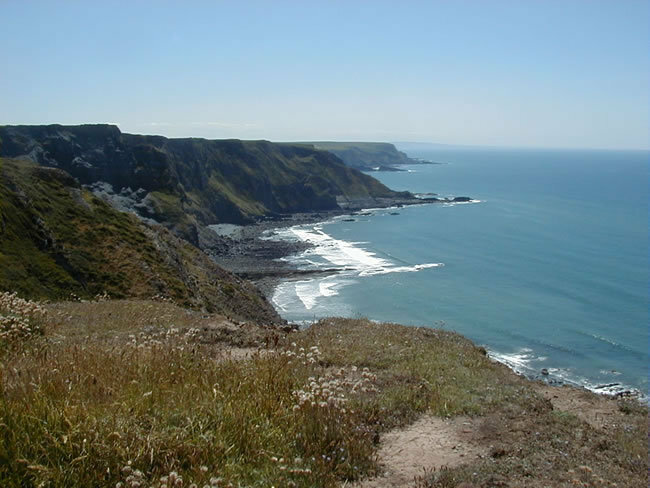 Hartland and Bucks Cross are situated in a beautiful coastal area of North Devon. The Hartland Peninsula is part of the officially designated North Devon Area of Outstanding Natural Beauty. Here you will find dramatic cliffs overlooking sheltered bays, woodland walks alongside the Abbey river, historic buildings such as Hartland Abbey, not to mention inns, tea rooms, restaurants, hotels and gardens. Discover the landscape and attractions in and around Hartland. Lots of information on places to visit and things to do in Hartland. Numerous films and TV shows have been made in and around Hartland. Parts of Walt Disney’s classic 1950s film of Treasure Island were filmed here. More recently, much of the BBC dramatization of Jane Austen’s Sense and Sensibility was filmed in and around Hartland (see some photos). Among other places you might want to visit are Hartland Abbey, Hartland Quay, the Cheristow Lavender Garden and Tea Room and Docton Mills Garden. Keen gardeners should also be sure to visit RHS Rosemoor Gardens, just a short drive away. The Hartland Aikido Club practises in the Bucks Cross Village Hall, which is right at the top of a winding road that leads down through a beautiful wooded valley to stunning the seaside village of Bucks Mills. If you come to practise with us, be sure to take the time to explore the valley and shore. Close by you will also find the picturesque village of Clovelly and if you are looking for a family day out, why not try The Milky Way or The Big Sheep? The Hartland Aikido Club is situated in one of the most beautiful areas of Britain. I hope we’ll see you soon!